This astonishingly artistic Japanese drama is full of powerful themes and images, even if it never really makes sense in mainstream cinematic terms. It centres on a group of teens over the course of about two years, between age 13 and 15, shifting back and forth in time to weave a tapestry of emotions and issues. The main topic is bullying, the gang dynamic, the extreme edge of peer pressure that dominates life for the shy Yuichi (Ichihara), who retreats into an online chatroom centred on the Bjork-like popstar Lily Chou-Chou. He befriends fellow student Hoshino (Oshinari), but their friendship shifts and changes as they get involved in petty criminal activity--bullying, robbery, a stolen holiday with friends that turns grisly, and eventually a seedy prostitution ring involving one of their classmates (Aoi). Piecing together the strands of the story is not easy, as it flows in a freeform style over us, blended with the gorgeous Debussey piano score that apparently inspires Lily's music. Writer-director Iwai is an eloquent artist, crafting something beautiful and magical here. Despite the films length (which we do feel), there's not a dull moment. In fact, we never want it to end, as the story's raw power resonates forcefully, even though we can't always follow the plotline or keep the characters straight. There's a floaty, ethereal quality to the film that's echoed heavily in the story and situations. But this isn't a fluffy, artsy-fartsy movie. It's gritty and funny, tackling issues of today's disaffected youth head-on, looking at society and family pressures in through unflinching yet sympathetic eyes. The characters' longing to find meaning in life, their obsession with anything that sparks of honesty, their mistrust of selfish motives ... it all rings so true that we don't need a cliched, obvious plotline to make it hit us right between the eyes. Seasons change. 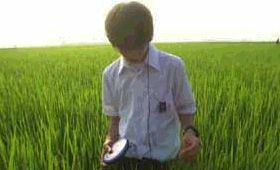 Yuichi (Ichinara) listens to Lily in the "bright, sterile green" ricefields.